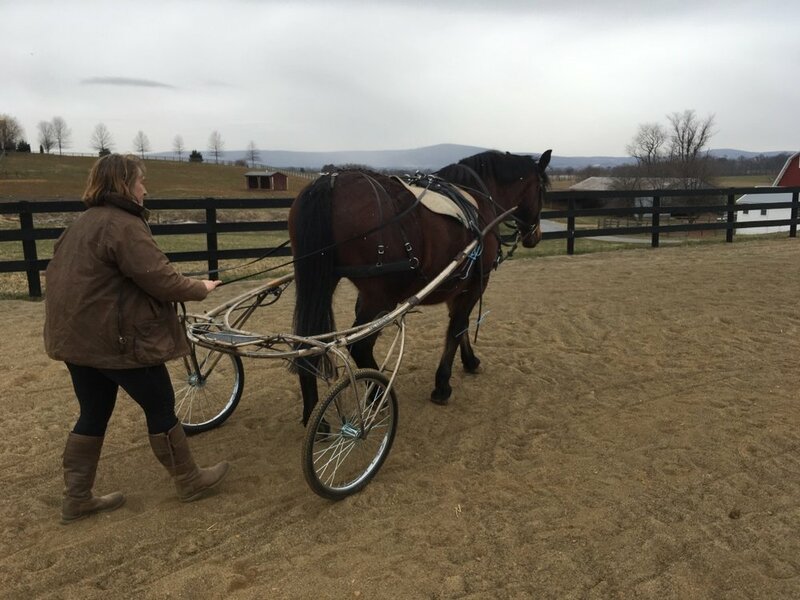 This past weekend we had a great experience harnessing pure Cleveland Bay mare Willow Ballare (aka Bally) to a cart for the first time. Bally has come back from Keratoma surgery in fall 2016 and is back in work. She is our guest hunt horse. While she is in her upper teens, it's never too late to teach a Cleveland something new! We hope that she'll pull a cart/carriage for our wedding this fall. She's been a great student thus far. Thanks goes to Marcia Brody for working with her. What a great way to wrap up a weekend that included trail riding and hunting Cleveland Bays. What a productive day.... After morning barn chores and working on the website for a while, I pulled Maestro and Chance from their paddock for grooming and lunging. They were gentlemen and good with being in the barn with others while in cross ties. Maestro in particular looked phenomenal. At lunch, I drove over the George Harne's to help with hound vaccination. Afterwards, I rode Orin and Marcia rode Mazie. Orin rode well and Mazie seemed quite settled. We took the two for a short hack around the farm after ringwork, and Mazie was quieter than Orin even. I was VERY pleased. After riding, Marcia helped me work with the weanlings. We started with Exeter since he was the most recent weaned and has had less time leading and being handled. He would follow Dulany pretty well. We even got a halfway decent pic of him despite all the mud. We spent a few minutes with Excalibur and Libby. Great day for working with Clevelands!!! !